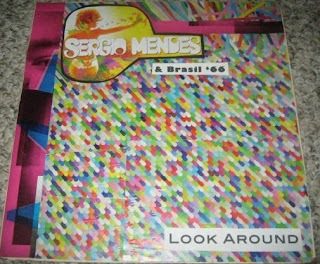 Check it out: this Sergio Mendes record didn't have a proper cover (it was living in a Tchaikovsky's 1812 Overture jacket) so I decided to collage my own. It's pretty groovy, don't you think? And very much in spirit with the original (shown at the top). 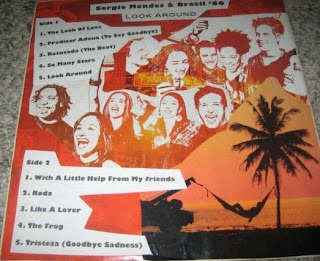 This LP includes covers of "The Look of Love," "With a Little Help from my Friends," "Like a Lover" and originals. 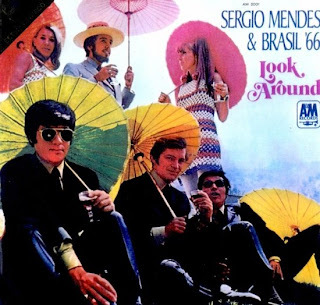 It's straight up smooth 1960s Brazilian bossa nova; good for a Sunday morning. I just read on wikipedia that this version of "Look of Love" was more popular than Dusty Springfield's. Also, Mendes performed the same song at the 1968 Oscars, which skyrocketed his popularity in the United States. He's still making records today with American artists like will.i.am, Erykah Badu, Chali 2na, India.Arie, John Legend, Justin Timberlake and Stevie Wonder. Not bad for a guy that's been around for 40 years. I've added some Mendes, old and new, to the playlist.